I was still missing my beloved "heart dog" Rudy when I learned of GALT's Second Family and began to fall in love all over again. 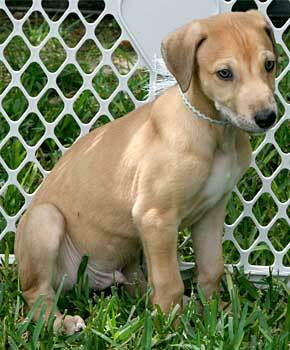 One pup in particular, Cole, looked so very much like my Rudy that I just had to bring him home. Eventually, I would learn that Cole had some issues resulting from lack of proper nutrition in the womb. Determined to make this all work, I got him the help that he needed, and it has been well worth it! 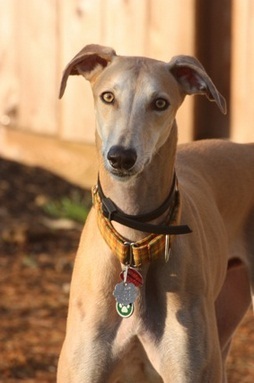 Today, Cole is a happy, playful boy who enjoys meeting new hounds at a weekly play group. He is always jumping and running happily at the center of the pack and is always ready for neck rubs. Sure, he needs structure and does not like change - but what grey does? I have learned so much from Cole. Your greyhound may not be the " perfect" greyhound, but the love and work that you put into helping them will be given back to you many, many times over. In all honesty, I can't imagine loving Cole any more that I currently do. He is my "golden eyed" boy and I love him with all my heart!